When we learn a new language, we start with a simple "Hello world". This is how it looks in HTML. The final code is messy, so we need tools to help us do our job. Today I would like to present you a new concept for building HTML documents that are full of different components (fancy galleries, social share buttons, 3rd party comment boxes and so on). It looks a lot like React, WebComponents and Template engines, but it's also a little different. 2. Write the HTML code in the body tag. 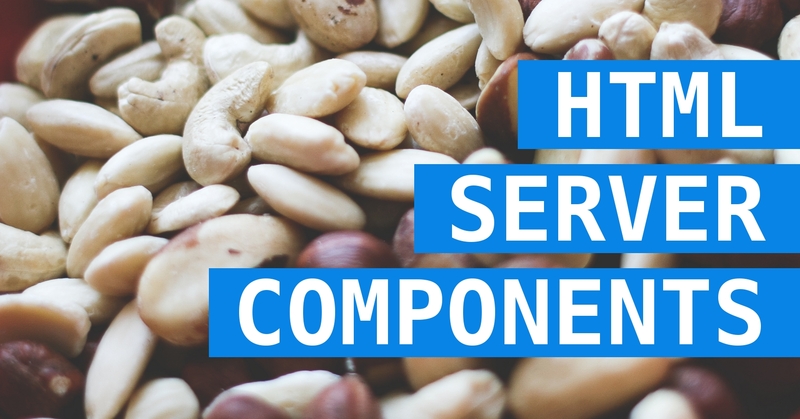 The concept is ... components, just like React and WebComponents, but on the server. A component is just an HTML document (with <html> and <body> tags). We create one for each part of the HTML page (header, footer, carousel, product list, social plugin). Then we merge them into the final HTML result. 2. The style tag from body.html is moved to the head of the result document. Simple, yet very powerful for real-world websites. And of course, components can communicate using attributes. And they can be nested too. All the code needed for one component to work is in the component's file. It's easy to develop, test and debug. It's easier, faster and simpler to develop websites using HTML Server Components. Need proof? Here is a sample web page build in PHP. View the source at GitHub. A very lightweight compiler (written in PHP) is used. It's available at GitHub too. It's only job is to merge the components by putting the different elements in the right places. In this article, I presented you a concept that I call HTML Server Components, an example web page and a PHP compiler. I'd love to hear your comments and ideas. The PHP compiler is really small and it's free on GitHub. If you want you can fork it or port it to other languages.